24 minutes before Ashtami ends to 24 minutes after Navami starts, is the time when Devi takes the form of Chamunda Mata. Time need not be Sunrise or Sunset of Ashtami or Navami. According to the Panchang (Hindu Calendar) each Tithi lasts for about 24 hours . If for example the Navami starts at 21.30 pm in the night then auspicious time will start at 21.06 (which is Astami ) and continue untill 21.54 (of Navami). This 48 minutes is called Sandhi kshan (संद्धि क्षण)or period of transit, when Devi in the form of Chamunda (चामुण्डा) is killing Chanda and Munda (the demons). 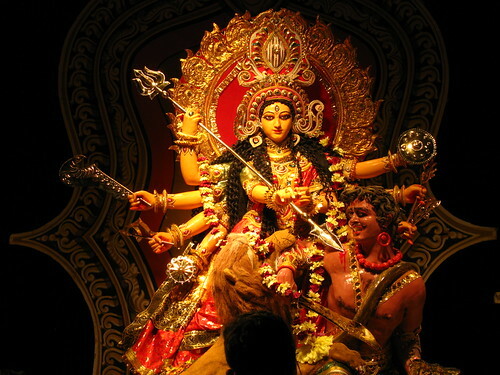 That is regarded as the most auspicious time of Navratri as Devi is ready to give boon after Sandhi kshan is over . During this most auspicious time of Navratra, a few moment of pray, chants, recites or path may results blessings of Mother Goddess Durga. Note : Every moments of Navaratra is very auspicious.